ST. JAMES, MO (October 4, 2018) – Grape harvest at St. James Winery is wrapping up in the Meramec Highlands and the leaves are starting to turn. 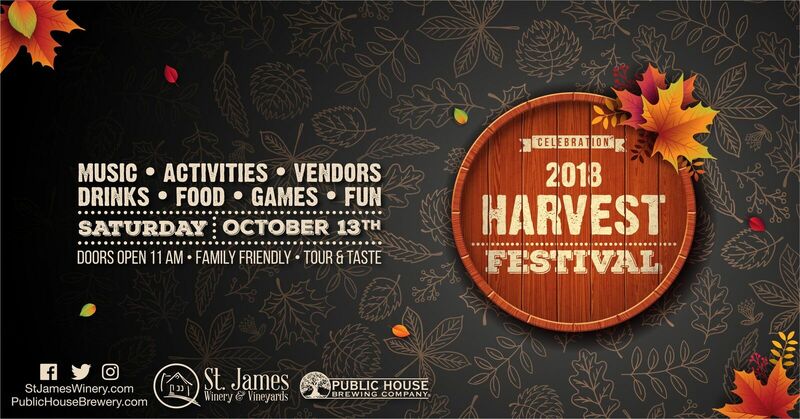 The winery and Public House Brewing Company invite the public to celebrate the bountiful fall harvest with them at their Third Annual Harvest Festival on Saturday, October 13 in The Gardens at St. James from 11 a.m. – 11 p.m. The Gardens is an outdoor gathering place shared by and located between the winery and brewery in St. James, MO (551 State Route B, St. James, MO 65559). The following vendors will be selling items from 11 a.m. – 4 p.m.
Test your taste buds on wine and beer samples from 11 a.m. – 4 p.m.